"My idea of heaven is eating paté de foie gras to the sound of trumpets." - Sydney Smith. FOIE GRAS Foie gras (French for "fat liver") is a food product made of the liver of a duck or goose that has been specially fattened. By French law, foie gras is defined as the liver of a duck or goose fattened by force-feeding corn with a gavage, although in Spain and other counties outside of France it is occasionally produced using natural feeding. CASPIAN CAVIAR - "Foie Gras & Confit." Fine Food Specialist - since 2012. "Buy Fine Foods & Specialty Items." 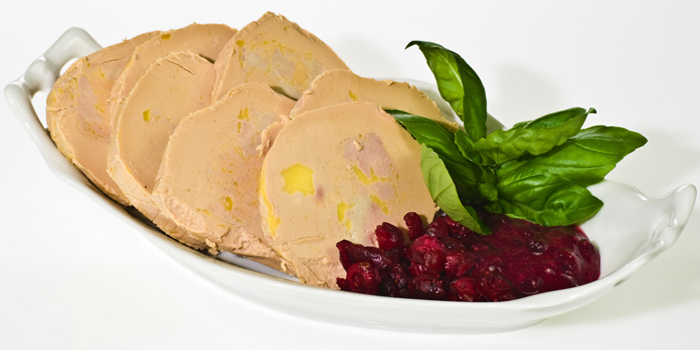 Foie gras has long been a French delicacy, and is now internationally popular, due to its rich, distinctive flavour. Lauded in gourmet kitchens and home cooking alike, foie gras is versatile, yet is most often served as a starter. Here at Fine Food Specialist we offer a broad selection of foie gras and foie gras related products, from fresh A grade duck and goose, to gourmet Strasbourg en croutes, something to suit every occasion. FOIE GRAS AT AMAZON.COM'S GROCERY & GOURMET FOOD - 1,650 results as of November 30, 2017. Foie Gras en Croute - "Georges Bruck de Strasbourg Foie Gras D'Oie 'Truffe' en Croute, a delicious goose foie gras with Black Winter Truffles." Foie Gras En Croute, 600g - "A decorative pastry case filled with rich, buttery & delicate foie gras for all to enjoy. Buy Fortnum & Mason's Foie Gras en Croute for 4 people online here." FORTNUM & MASON - Piccadilly since 1707. "Our foie gras is produced by just two farms carefully selected for their excellent welfare standards; smooth and creamy, it is the simplest way to transform a meal into a banquet." Le Comptoir de la Gastronomie - since 1894. "Spécialités du Sud-Ouest." French gastronomic institution is both a restaurant and a delicatessen. You can purchase all the goodness of French gastronomy here: fine wines from all other France: Bordeaux, Bourgogne, etc., Champagne, French vodka but also foie gras, confit duck, caviar, smoked salmon, different kinds of patés, cheeses ... 34, rue Montmartre, 75001 Paris, France. Tour d'Argent - "Offer yourselves one “ducky ”moment with our delicious rillettes with duck foie gras and prepare your vinaigrette Tour d'Argent with our hand-crafted products."